The best thing that ever happened to my Japanese language study was finding Mangajin magazine in the early 90s. Subtitled "The Magazine of Japanese Pop Culture & Language Learning," it perfectly contextualized the study of Japanese into the culture. Alas Mangajin ceased publication in 1998. The single most valuable learning aspect of Mangajin was it's four-line translation format, a sample of which appears at right. 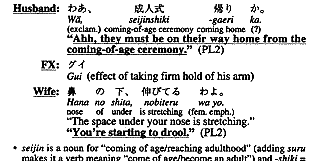 The first line is the original Japanese, the second is the romanji, the third is the literal word-for-word translation, and the four line is the natural English eqivalent. The beauty of the four-line format was that it let you study the aspects of the language separately: line 1 to line 2 was reading; line 2 to line 3, vocabulary; and line 3 to line 4, grammar. Ever since, I've longed to find an easy way to reproduce the format as a learning tool for others. You can get a pretty good reproduction in HTML, but it's painful to produce even in a modern HTML editor like DreamWeaver. Eventually, I wrote a special-purpose application specifically to produce my variation of the format (contact me if you're brave and interested in actually trying the application). The longest thing I've produced with it so far is a translation of the first chapter of 宇宙のひみつ, an educational manga for elementary school students. Click to check it out! Before I wrote the app, I took my final exam study sheet from Japanese 2B at City College of San Francisco and created the four-line format by hand. It was brutal, and motivated me to write the app! As I was starting to learn Japanese, I got a small paperback book called "Read Japanese Today" by Len Walsh. While it only covers a small number of the Kanji, it's a great presentation of the pictographic origins of the basic Kanji that are used in Japanese. In particular -- unlike all of the "textbooks" I've used since -- it presents Kanji in a logical order, teaching you the radicals before trying to teach you Kanji based on those radicals. The one thing Read Japanese Today doesn't have is an index! Because the book is presented in a linear, almost narrative format, it's impossible to look back into it and find the Kanji you're actually after. So, below, I'm happy to present an index to Read Japanese Today. The links below will take you to the index, sorted in 4 different ways. You can also use your browser's find function to look for the word you're interested in. A guide to the conventions I used in preparing this is at the bottom. If you find errors or omissions (after checking the conventions), please contact me or respond. If you're studying Kanji, you should definitely get a copy of this book and memorize these 300 Kanji -- they're a great start towards reading literacy! Here's the amazon.com listing. Japanese 2B: When studying for my final in the class at CCSF this team, I prepared this translation of our study sheet. Mostly it proves I'm getting slightly faster at recreating the classic Mangajin four-line translation format in HTML. After I prepared the index, I realized I could easily use the data I created to build other things. The first item I did are the Kanji reading and writing quizzes below. The Reading Quizzes present the Kanji and have a space to enter the On and Kun readings. The Writing Quizzes present the readings (and meanings) and have a space to write the Kanji. Both present the page # in RJT in case you need a hint! Each quiz has 50 randomly-selected Kanji. The easy quizzes are mostly drawn from the front of the book, and include mnemonics that may help. The reading quizzes have a space for an interactive form, and are designed to be printed after completion. The writing quizzes have an underlined space, are are designed to be printed before being filled out. I made these for the sake of my own study, but please feel free to use these for any purpose! If you want access to the XML data used to generate all of these, here it is. Happy XML hacking! Note: I haven't yet finished entering all of the family or place names used as examples into this index. The reading for this Kanji when used as an independent word. If this is a compound word, only this reading is specified. The portion of the reading in parentheses should be written in hiragana. In general I have tried to stick to readings listed in the book even when I know additional readings. The reading for this Kanji when used within a larger compound. English meanings. These are not necessarily correlated with the various readings. Capital letters indicate either proper nouns or stock phrases from English (e.g., "No Smoking"). In general I have tried to stick to the meanings listed in the book rather even when I know additional meanings. The kanji. This page is in the Unicode character set, encoded as UTF-8. If you don't have Japanese language support installed in your browser you may not be able to see the Kanji. Check the update site for your OS if the Kanji don't display; all OSes have easily installable Japanese language browser support now. The page number in Read Japanese Today, at least the page number in my copy of the 1990 forty-second printing. Briefly, there was a non-XML-driven version of this page. If you want to refer to that, it's here.